Bears (Ursus species) have a unique status in pop culture: not quite as cuddly as dogs or cats, not quite as dangerous as wolves or mountain lions, but ever-compelling objects of fear, admiration, and even envy. With some minor exceptions, all eight bear species have roughly the same appearance: large torsos, stocky legs, narrow snouts, long hair, short tails, and plantigrade postures; that is, bears walk flat-footed on the ground, like humans but unlike most other mammals. American black bears (Ursus americanus) live in North America and Mexico; their diet consists primarily of leaves, buds, shoots, berries, and nuts. Subspecies of this bear include the cinnamon bear, the glacier bear, the Mexican black bear, the Kermode bear, the Louisiana black bear, and several others. Asian black bears (Ursus thibetanus) live in Southeast Asia and the Russian Far East. They have blocky bodies and patches of yellowish-white fur on their chests, but otherwise resemble American black bears in body shape, behavior, and diet. Brown bears (Ursus arctos) are some of the world's largest terrestrial meat-eating mammals. 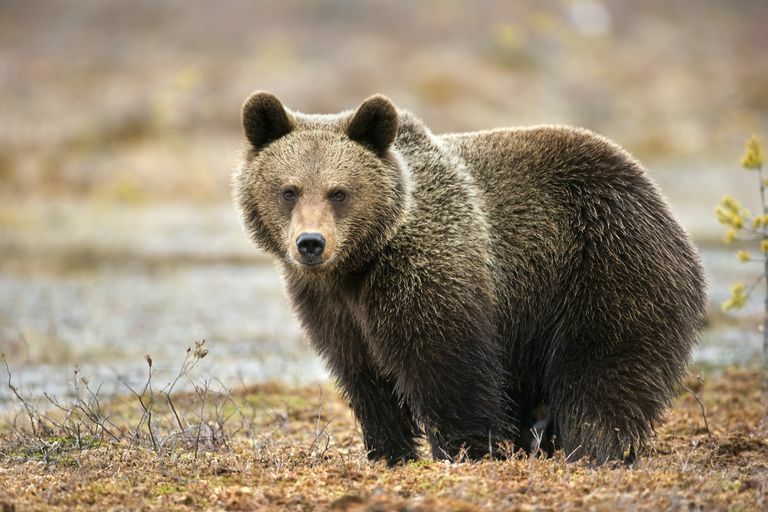 They range across North America, Europe, and Asia and include numerous subspecies, such as the Carpathian bear, the European brown bear, the Gobi bear, the grizzly bear, the Kodiak bear, and several others. Polar bears (Ursus maritimus) rival brown bears in size. These bears are restricted to a circumpolar region in the Arctic, reaching south into northern Canada and Alaska. When they're not living on pack ice and shorelines, polar bears swim in open water, feeding on seals and walruses. Giant pandas (Aeluropoda melanoleuca) feed almost exclusively on bamboo shoots and leaves in the central and southern regions of western China. These distinctly patterned bears have black bodies, white faces, black ears, and black eye spots. Sloth bears (Melursus ursinus) stalk the grasslands, forests, and scrublands of Southeast Asia. These bears have long, shaggy coats of fur and white chest marks; they feed on termites, which they find using their acute sense of smell. Spectacled bears (Tremarctos ornatos) are the only bears native to South America, inhabiting cloud forests at elevations over 3,000 feet. These bears once lived in coastal deserts and high-elevation grasslands, but human encroachment has restricted their range. Sun bears (Helarctos malayanos) live in the lowland tropical forests of Southeast Asia. These small ursines have the shortest fur of any bear species, their chests marked with light, reddish-brown, U-shaped patches of fur. Most bears are omnivorous, feasting opportunistically on animals, fruits, and vegetables, with two important outliers: the polar bear is almost exclusively carnivorous, preying on seals and walruses, and the panda bear subsists entirely on bamboo shoots. Oddly enough, though, pandas' digestive systems are relatively well adapted to eating meat. Because the vast majority of bears live in high northern latitudes, they need a way to survive the winter months, when food is dangerously scarce. Evolution's solution is hibernation: Bears go into a deep sleep, lasting for months, during which their heart rates and metabolic processes slow drastically. Being in hibernation isn't like being in a coma. If sufficiently roused, a bear can wake up in the middle of its hibernation, and females have even been known to give birth in the deep of winter. Fossil evidence also supports cave lions preying on hibernating cave bears during the last Ice Age, though some of these bears woke up and killed the unwelcome intruders. Bears may be the most antisocial mammals on the face of the earth. Full-grown bears are almost entirely solitary. This is good news for campers who accidentally encounter lone grizzlies in the wild, but quite unusual when compared with other carnivorous and omnivorous mammals, ranging from wolves to pigs, that tend to congregate in at least small groups. Depending on species, a bear's basic communication needs can be expressed with about seven or eight different "words"—huffs, chomps, groans, roars, woofs, growls, hums, or barks. The most dangerous sounds for humans are roars and growls, which denote a frightened or agitated bear defending its territory. Huffs are generally produced during mating and courtship rituals, hums—a bit like the purrs of cats, but much louder— are deployed by cubs to demand attention from their mothers, and moans express anxiety or a sense of danger. Giant pandas have a slightly different vocabulary than their ursine brethren: In addition to the sounds described above, they can also chirp, honk, and bleat. Given the proliferation of so-called bear dogs millions of years ago—including the standard-bearer of the family, Amphicyon—you might assume that modern bears are most closely related to dogs. In fact, molecular analysis shows that the closest living relatives of bears are pinnipeds, the family of marine mammals that includes seals and walruses. Both of these mammalian families descend from a last common ancestor, or "concestor," that lived sometime during the Eocene epoch, about 40 million or 50 million years ago. The exact identity of the progenitor species, however, remains a matter of speculation. Given that the populations of medieval Europe didn't have much contact with polar bears or panda bears, it makes sense that European peasants associated bears with the color brown—which is where the English name of this animal derives, from the old Germanic root bera. Bears are also known as ursines, a word that has ancient roots in Proto-Indo-European languages that were spoken as far back as 3500 BCE The long history of this word makes sense, given that the first human settlers of Eurasia lived in close proximity to cave bears and sometimes worshiped these beasts as gods. Like their close cousins, seals, and walruses, bears are some of the most sexually dimorphic animals on earth. Males are significantly bigger than females​ and the bigger the species, the larger the disparity in size. In the largest brown bear subspecies, for instance, males weigh about 1,000 pounds and females only slightly more than half that. However, even though female bears are smaller than males, they're not exactly helpless. They vigorously defend their cubs from male bears, not to mention any humans foolish enough to interfere with the child-rearing process. Male bears, however, will sometimes attack and kill cubs of their own kind, in order to induce females to breed again. Although there are some differences among the species, in general, female bears generally become sexually mature at between 4-8 years of age, and have litters every three or four years. Bear breeding occurs during the summers—it is the only time when adult bears get together at all—but implantation doesn't typically occur until late autumn. Total gestation time is 6.5–9 months. Cubs are born singly or up to three at a time, generally born in January or February, while the mother is still in hibernation. The young usually stay with their mother for two years. After mating, females are left to raise the young by themselves—for a period of about three years, at which point—eager to breed with other males—the mothers chase the cubs away to fend for themselves. Within the past 10,000 years, human beings have domesticated cats, dogs, pigs, and cattle—so why not bears, an animal with which Homo sapiens has coexisted since the end of the Pleistocene epoch? One explanation is that bears are intensely solitary animals, so there's no room for a human trainer to insert himself into the "dominance hierarchy" as the alpha male. Bears also pursue such varied diets that it would be difficult to keep even a tame population well-supplied. Perhaps most important, bears are anxious and aggressive when stressed, and simply don't have suitable personalities to be house or yard pets. Considering that early humans used to worship bears as gods, our relationship with ursines hasn't exactly been stellar over the last few hundred years. Bears are especially susceptible to habitat destruction, are often hunted for sport, and—if we may mix our animal metaphors—tend to become the scapegoats whenever campers are attacked in the wild or garbage cans are overturned in suburbs. Today, the most endangered ursines are panda bears, because of deforestation and human encroachment, and polar bears, because of climate change. On the whole, black and brown bears are holding their own, even though adverse interactions with humans have increased as their habitats become more constricted. Dharaiya, N., H.S. Bargali, and T. Sharp. "Melursus ursinus." The IUCN Red List of Threatened Species: e.T13143A45033815, 2016. McLellan, B.N.et al. "Ursus arctos (amended version of 2017 assessment)." The IUCN Red List of Threatened Species: e.T41688A121229971, 2017. Swaisgood, R., D. Wang, and F. Wei. "Ailuropoda melanoleuca (errata version published in 2017)." The IUCN Red List of Threatened Species: e.T712A12174566, 2016. Downloaded on 15 April 2019. Wiig, Ø. et al. "Ursus maritimus." The IUCN Red List of Threatened Species: e.T22823A14871490, 2015.